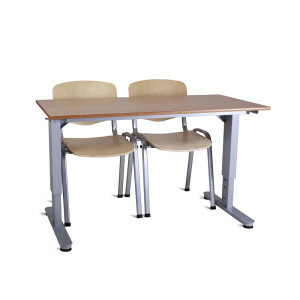 Advanced ‘H’ Frame Tables make working at high-top tables much easier. 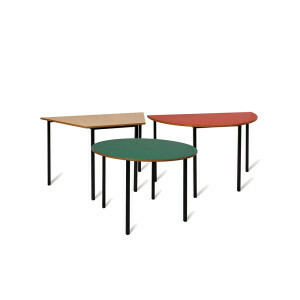 Featuring 25mm or 40mm section ‘H’ frames, these substantial tables are suitable for many environments; especially in education. A range of work top finishes are available including laminated Beech, Maple, Oak, Red, Green, Yellow and Light Grey. 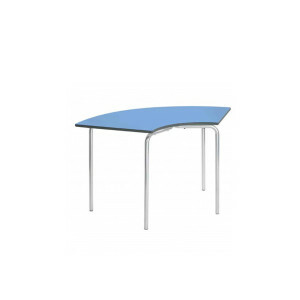 The table work tops may be either 18mm (standard) or 25mm thick MDF with clear lacquer or 2mm PVC edging. 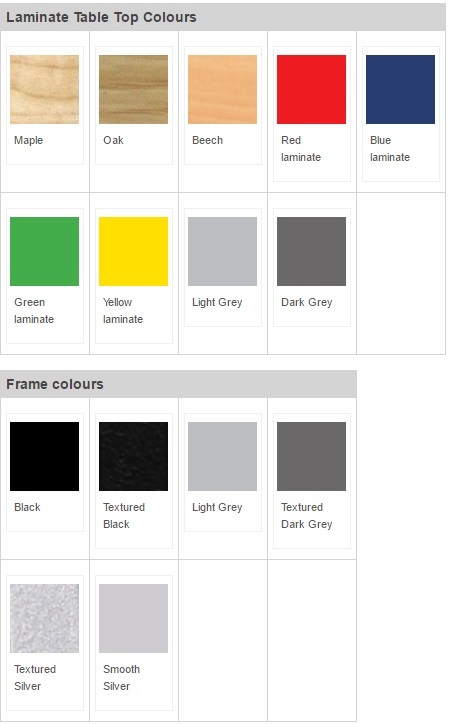 We also offer extra tough Trespa® work tops in 16 or 13mm thickness. 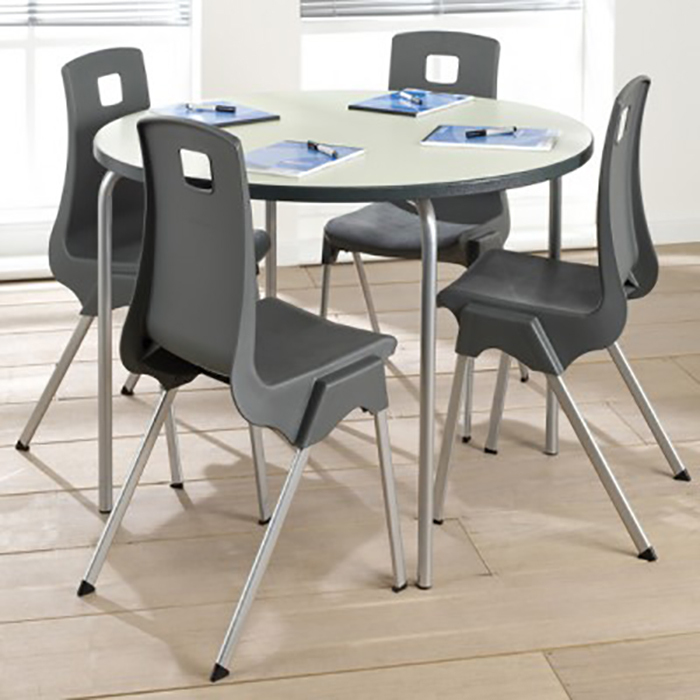 Advanced Height Adjustable Tables are easily adjusted to a range of heights, making them particularly useful for wheelchair users. 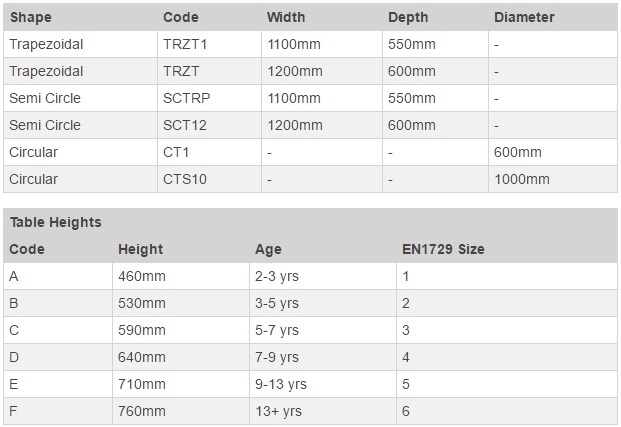 Advanced 18mm or 25mm MDF Laminated tops may be finished in clear lacquer, 2mm PVC or PU edging.Table frame is in Silver only. 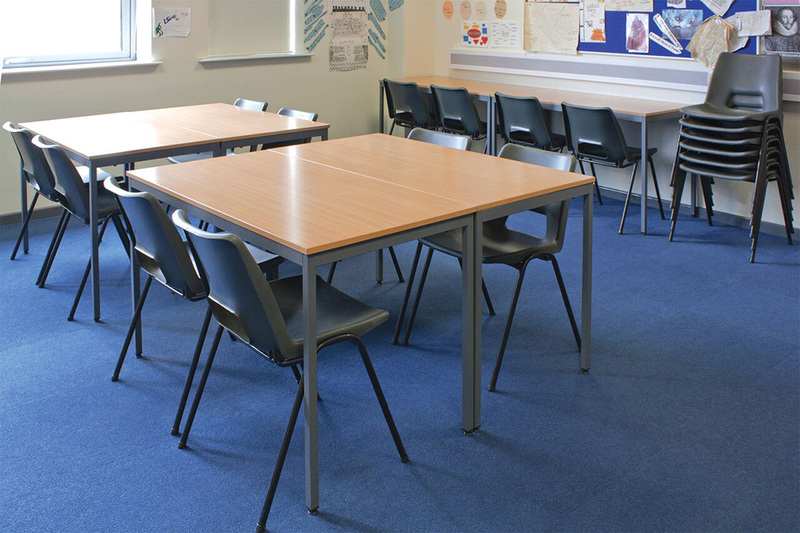 Advanced School Tables are available in a wide range of top finishes including Laminated MDF in Beech, Blue, Red, Green and Yellow. We also offer a selection of table edge finishes. These tables can be made in many different shapes and sizes and many will spiral-stack. 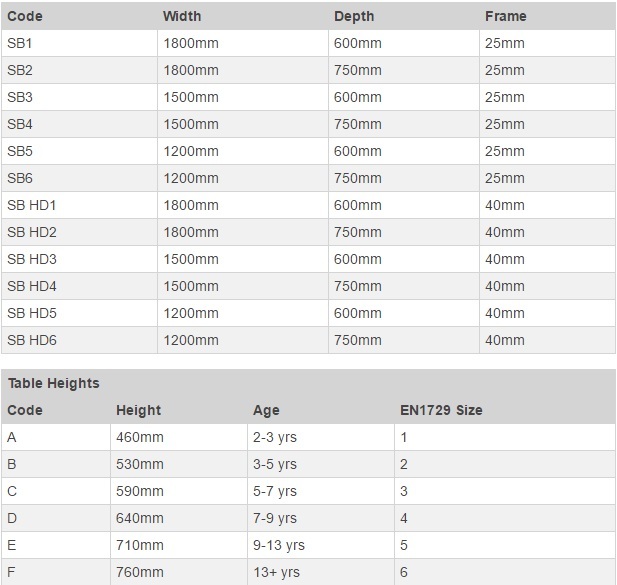 Our 25mm square section four leg frames may be powder coated in Black or Grey EPC for maximum durability. Advanced Spiral Stacking Tables are designed to stack in a spiral or directly on top of each other. 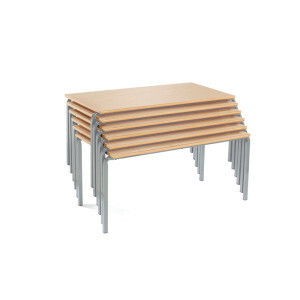 These tables can be made in many different shapes and sizes and still offer the Spiral Stacking System. 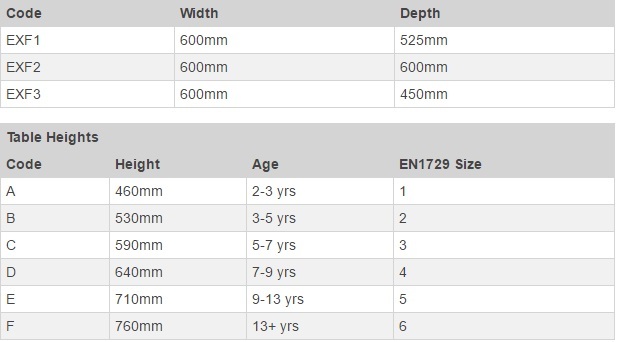 The 1.5mm gauge four leg frames may be powder coated in EPC finish for maximum durability. Flexible and dynamic modular table with endless tessellation possibilities. 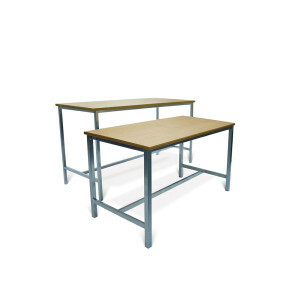 These Crushed Bent tables are ideal for compact storage as they stack and tidy away easily. 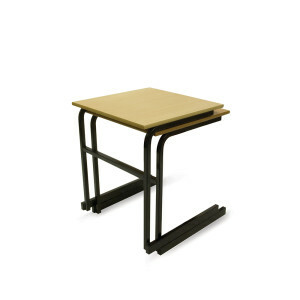 The square tube frame is available in various colour options, as is the 18mm MDF laminate top. 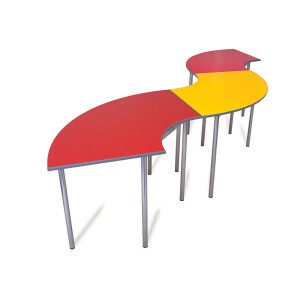 Supplied with a polished and lacquered MDF edge as standard. This stylish 32 mm round frame is supplied with a resilient high pressure 25 mm top which is finished with Light Grey or Charcoal Duraform edging. 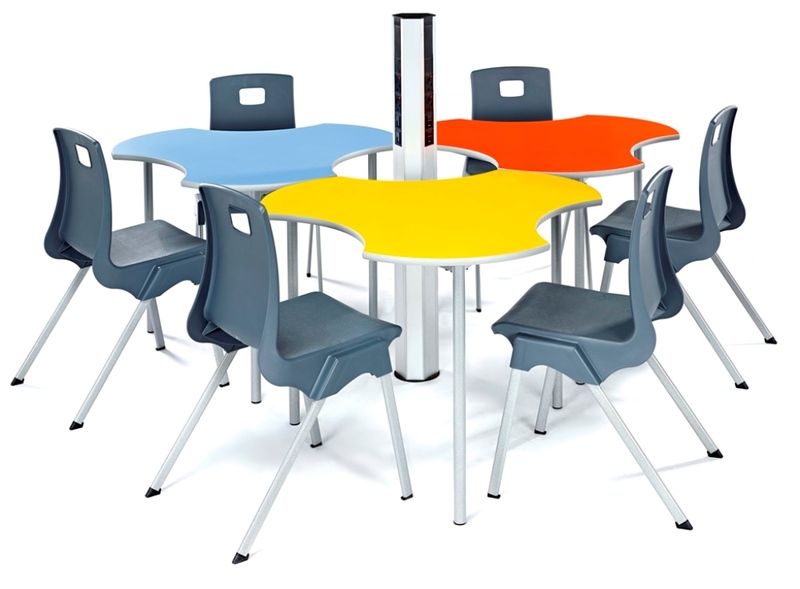 Various shapes and colours are available in this range to really brighten up your classroom! 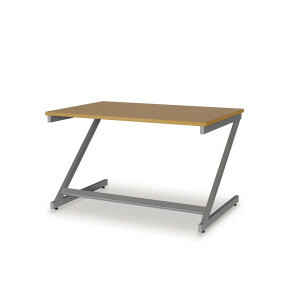 Other benefits include height adjustable feet to ensure that these tables never wobble, and tamper-proof screw fixings. 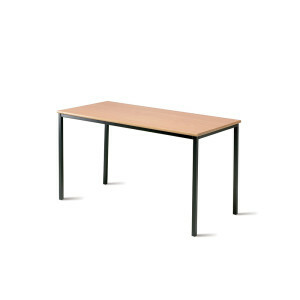 Equation™ tables come with a fantastic 10 year guarantee. 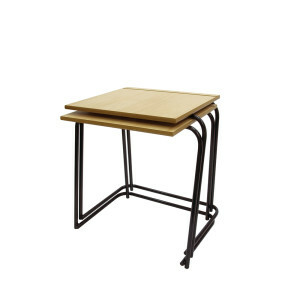 Our ‘X’ Frame folding exam table folds and stores away with ease. Our compact design is very narrow allowing for maximum capacity on our table trolley. Our simple sliding system is both sturdy and easy to operate. 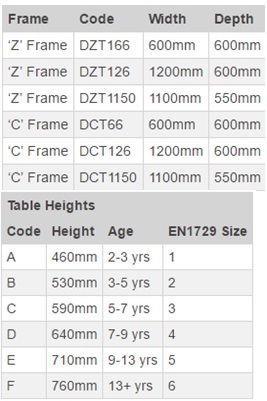 Standard table height is 710mm; other heights available on request. Plywood tops available on request. The Advanced Heavy Duty Cantilever Table features a Crush-Bent Steel frame design which allows tables to be stacked with ease. 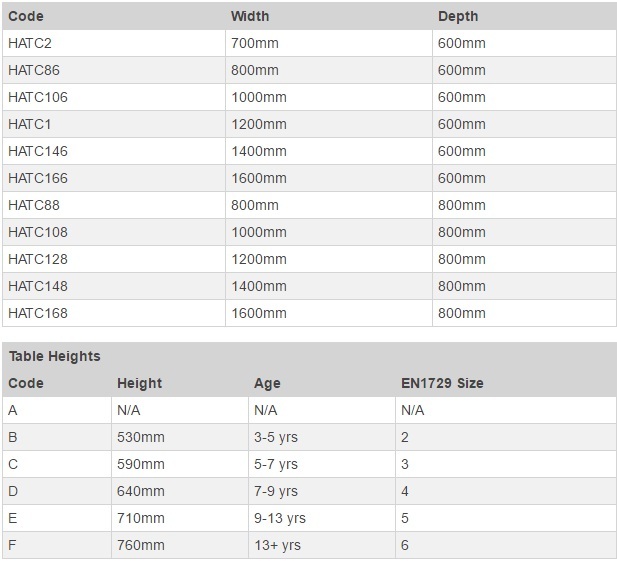 Our 25 x 25mm upper leg frame and 50 x 25mm lower frame make for a very strong and durable table that will stack up to 5 high. 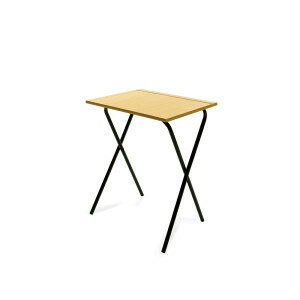 Our Nesting Table features 1.5mm gauge steel frame and a hard-wearing worktop. 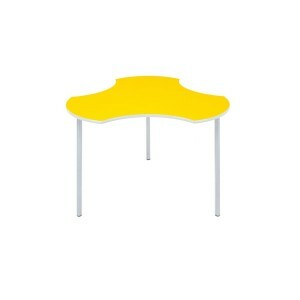 Shaped to stack with ease and also perform as a comfortable table. Nesting Tables stack up to 5 high.